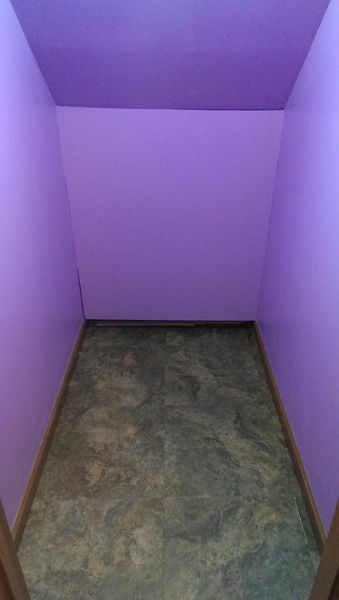 One of the things about our house which has never worked is that there's not a great place for the litter boxes. Our laundry room is too small, our bathrooms are too small for more than one, and, even if I didn't like litter boxes in the kitchen anyway, our kitchen isn't really laid out to accommodate one, since our kitchen has four (!) doors in it. 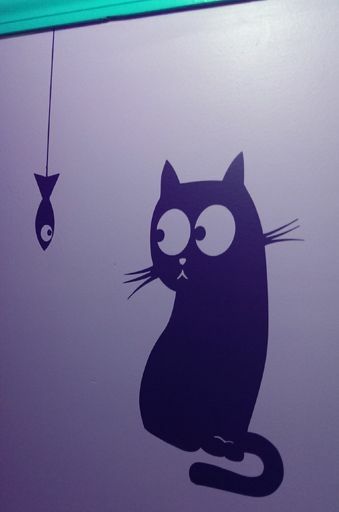 As a result, the primary litter boxes have long been in the guest bedroom, which isn't ideal for several reasons, not least of which is that as soon as you close the door to the guest room, the cats scratch at the door to get in. 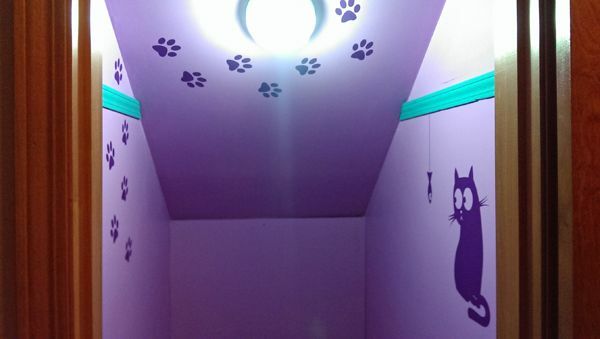 So, recently, I had the idea of turning our understairs closet into a cat nook! First, Iain and I cleaned all the crap out of the closet. I wish I had taken a before picture, but just imagine approximately one million coats, hats, gloves, scarves, and assorted junk just piled in there haphazardly. 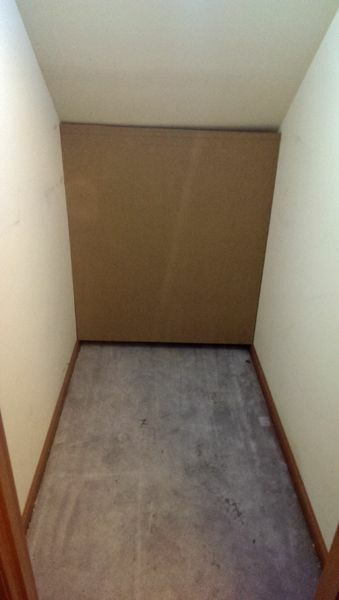 Then we bought a piece of plywood and Iain cut it to fit, so we could close off the narrow back end of the closet. 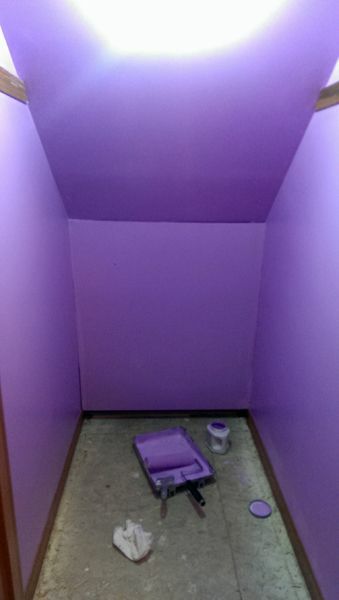 Then we pulled up the carpet and painted the closet (including the plywood board) a happy purple. Next, Iain laid leftovers from the inexpensive laminate we used to update the kitchen floor a couple of years ago. It's easy to clean up, in case there are any accidents outside the litter box. 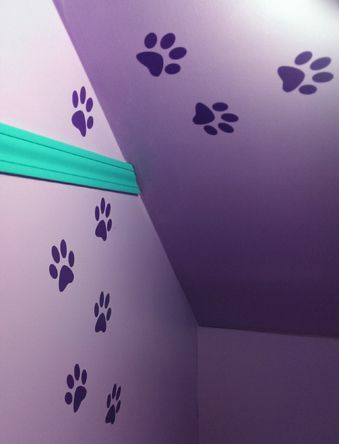 Next, we painted the trim a happy complementary teal and added some fun violet decals to the walls and sloping ceiling. I put up the pet gate which keeps the dogs out and allows, via a small pet door, the cats to move freely in and out, and I put in some of the cats' favorite toys. 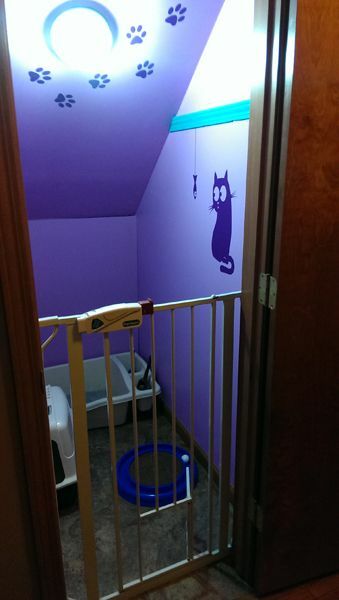 And voilà!—we had transformed our junked-up closet into a cute little cat nook that gives the kitties a space all their own and also solves our cat litter problem. I wish the colors were turning out better in the photos, but you get the idea. 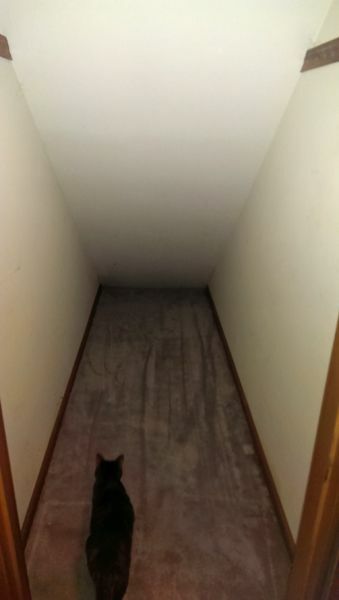 The cats completely love it, and so do we. A totally transformed space in our home, functionally and aesthetically, for the cost of a sheet of plywood, some paint, and some decals. Yay!